Carl is a PGA Member and ranked as a Top 100 Teacher in America and former Head Golf Professional who served his apprenticeship under Paul Runyan. Carl has had an extensive career in golf instruction with numerous accolades, he has played an invaluable roll in the development of golf instruction for the Jim McLean Golf Schools and many other projects. Carl grew up at the Rancho Santa Fe Golf Club. He was president of San Diego Junior Golf 1957- 1958. Attended San Diego State University in 1958 -1962. Started the Washington State Junior Golf Association in 1972. 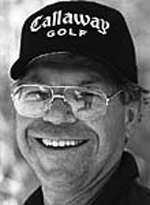 Carl started the 1st golf school west of the Mississippi at the La Costa Resort & Spa in 1983, and held the position as the Director of Instruction at the La Costa Resort and Spa for 12 years. A consultant for Callaway Golf 1985 - 1996. Carl and Jim McLean have worked closely together since 1969 as Jim's personal golf instructor. Carl is regarded as an expert on golf video research and was instrumental in the development of the Jim McLean Golf School philosophy of teaching. Wanting to play high school golf, make a college golf team, get your PGA Tour Card is Carl Welty’s speciality. Craig Welty Western Washington 3 time all american, athlete of the year, and Hall Of Fame member.